A performance of Don Giovanni with the great Italian baritone Antonio Scotti (as Don Giovanni). 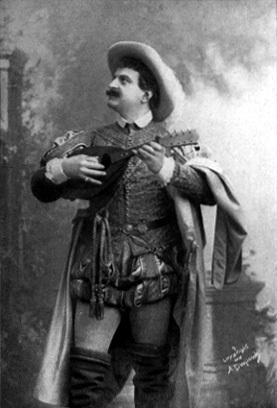 Scotti sang the role of Don Giovanni at Covent Garden, London, in 1899 and again at the Metropolitan Opera, New York in December of the same year. Luigi Bassi (1766-1825) in the title role of Mozart's Don Giovanni in 1787. Bassi was a great Italian operatic baritone. 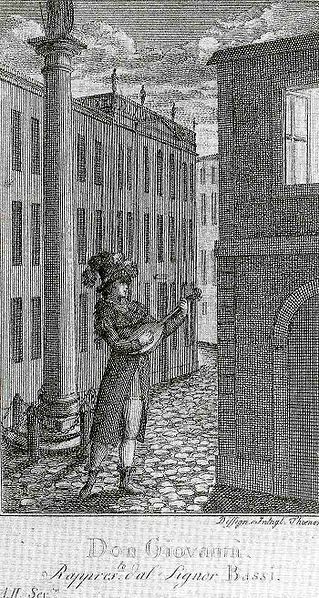 Mozart wrote the number Là ci darem la mano in Don Giovanni at Bassi's request. Note: This picture gallery page includes drawings, paintings, photos and images of performances of the opera, Don Giovanni, as well as of the opera singers, stage sets, manuscripts, and more.